According to the international scientific community, the window of opportunity is rapidly closing to make the transformative and radical steps required to prevent global warming exceeding the critical point of a 1.5 °C rise. The International Panel on Climate Change (IPCC) says we have just over a decade left to take decisive action to reduce the amount of carbon in the atmosphere. Internationally carbon pollution must be cut by 45% by 2030 and come down to zero by 2050. Over the next four, critical years the world’s fifth largest country will be led by a President who is determined to destroy the ‘lungs of the planet’ by accelerating the deforestation of the Amazon rainforest against the promises that Brazil made in the Paris Climate Change Agreement of 2015. This would reduce the planet’s ability to absorb and store carbon, and thereby dramatically increase the amount of carbon in the atmosphere. The election of Bolsonaro as President of Brazil marks a dire turning point in the development of an international axis of climate change denial which has become increasingly influential and powerful since the election of US President Donald Trump in 2016. The rise of this reactionary tide in the US and now Latin America, represents the biggest obstacle to preserving the planet as a home for humanity. It is a movement which is strongly opposed to taking action to stop climate change and is also intent on pursuing a programme that is the opposite of what is required to keep warming below 1.5°C: aggressively extracting the world’s remaining fossil fuels and destroying the world’s most important rainforest. In its recent and authoritative ‘Special Report’ published in October 2018, the IPCC stated that “limiting global warming to 1.5 °C would require rapid and far reaching systems transition occurring during the coming one to two decades, in energy, land, urban, and industrial systems.” In addition to abandoning fossil fuel extraction to reduce carbon emissions, the IPCC says that the world must also undertake reforestation and ecosystems restoration in order to remove carbon dioxide that has already been released into the atmosphere. The consequences of exceeding 1.5°C of global warming includes widespread famine, cities and entire countries submerged in water, deadly heatwaves, floods, forest fires, hurricanes and climate wars – it is a recipe of human misery and suffering on a massive scale. Under the leadership of Trump, now with the help of his puppet President in Brazil, imperialism is leading humanity in the direction of barbarism. The combination of aggressively increasing the extraction of fossil fuels and destroying Amazon rainforest in Brazil presents an existential threat to humanity. Bolsonaro has started to unravel Brazil’s status as world leader on tackling climate change. Enormous struggles will be needed to defend the progressive legacy of Brazil’s Workers’ Party (PT) on climate change both domestically and internationally. Even before he won the Presidential election, Bolsonaro’s election campaign had an immediate effect on the Amazon – he emboldened illegal loggers, which resulted in deforestation increasing by 36% during the election period. Following his election victory, Bolsonaro’s first priority has been to launch an offensive against the environment. The appointment of Ernesto Araujo as Bolsonaro’s Foreign Minister has alarmed environmentalists across the world. The person now responsible for conducting Brazil’s international diplomacy on climate change has dismissed climate science as a “dogma” and part of a plot by “cultural Marxists” to promote the growth of China and undermine economies in the West. In a clear declaration of intent, following his appointment in November 2018, Araujo announced Brazil’s withdrawal from hosting the UN’s Conference on Climate Change which was scheduled to take place in November 2019. Upon being inaugurated as President on 1st January 2019 Bolsonaro’s first priority has been to issue an Executive Order to facilitate the acceleration of deforestation in order to open up the Amazon rainforest for further exploitation by agribusiness, mining and construction companies. This Executive Order hands control of 13% of Brazil’s territory, including large swaths of rainforest, from the National Indian Foundation (FUNAI) to the Agriculture Ministry. Bolsonaro appointed the leader of Brazil’s farm caucus in Congress, Tereza Cristina, to be the Agriculture Minister, so alarmingly agribusinesslobby now has direct control over the Agriculture Ministry. The priority of agribusiness is to chop down the rainforest in order to expand their operations and boost their profits, which will also involve a huge attack on indigenous people. Evidently these decisions indicate that Bolsonaro is preparing for an enormous assault on the Amazon rainforest. The consequences have global dimensions because the Amazon is estimated to contain 10% of the world’s biomass which means it absorbs and stores massive amounts of atmospheric carbon dioxide. Such a policy goes against the promises Brazil made under the Paris Climate Change Agreement signed in 2015 under the leadership of the Workers’ Party government. Under these promises Brazil needs to eliminate illegal deforestation in the Amazonia by 2030 alongside restoring and reforesting 12 million hectares of forests by the same deadline. The Workers’ Party’s (PT) record on reducing deforestation, particularly during the time that Lula da Silva was President, was impressive. From 2005- 2012 deforestation in Brazil was reduced by approximately 80%. This action helped to reduce Brazil’s greenhouse-gas emissions by 39% between 2005 and 2010. However, Brazil has been sliding backwards on climate change since the coup against the Workers’ Party President Dilma Rousseff in 2016. During the year of the coup total deforestation increased by almost 30% compared to 2015. During his time in office the right wing coup-President Michel Temer cut the Environment Ministry budget by 50% and also cut deforestation monitoring by 70%. The record of the Workers’ Party (PT) governments on climate change – which included reducing deforestation and developing renewable energy (the result of which is that Brazil has one of the cleanest electricity portfolios in the world with 80% of its electricity supply coming from renewables in 2018) – made Brazil a significant progressive force on one the greatest challenges of our age. Brazil’s progressive action on climate change was both in the best interests of the people of Brazil and the population of the whole world. Bolsonaro’s intention is for Brazil to now play a leading role on the other side of this huge international battle –, on the side of the fossil-fuel industry, agribusiness, and their backers in finance capital, and of Donald Trump. There is a global right wing offensive, led by US President Donald Trump, to thwart the the efforts of humanity to prevent catastrophic levels of global warming in order to advance the interests of short term profits for a tiny global elite. On present trends the world is set for 3.3°C of warming by 2100, according to the latest Carbon Action Tracker (CAT) report published in November 2018. This is more than double the 1.5°C limit agreed in the Paris Climate Agreement. Around 1°C of warming since pre-industrial levels has already taken place – primarily caused by burning fossil fuels, methane release from farmed cattle and deforestation. This level of warming has already caused large humanitarian disasters in the form of floods, droughts, hurricanes and wild fires. If this current trajectory is not averted the impact will be catastrophic. All countries across the world need to be taking action to rapidly reduce carbon emissions. Trump is leading the US in the opposite direction. Trump is a champion of fossil fuels and infamously described climate change as “a Chinese hoax.” Upon becoming President he started the process to withdraw the US from the Paris climate change agreement. Trump has pursued an energy policy that has aggressively promoted fossil fuels and has cut the US government environmental agencies and funding. This increase in US emissions is the result of the “fracking revolution” in oil and gas which has seen production of unconventional fossil fuels soar, at a time when the US should be making a rapid transition to renewables. Over the course of 2018 the US output of crude oil production increased by 1.6 million barrels per day – taking the total up to 11.6 million barrels per day, overtaking Saudi Arabia and Russia. The US is now the number one producer of oil and gas in the world. The US state of Texas alone is projected to pump more oil than Iraq and Iran during 2019. The International Energy Agency has said that it expects the US to be responsible for 75% of global oil growth and 40% of global gas growth over the next 6 years. Stopping Trump aggressively expanding the US’ exploitation of fossil fuels and Bolsonaro’s plans to accelerate the deforestation of the Amazon rainforest are critical tasks to stop climate change. Keeping climate change to 1.5 °C requires unprecedented and urgent transformation of the economy away from a reliance on fossil fuels, and a massive increase in carbon sinks – the most significant of which on earth is the Amazon rainforest. The programmes of Trump and Bolsonaro are completely incompatible with this. Absurdly, both Trump and Bolsonaro claim that their destructive exploitation of fossil fuels and attacks on the Amazon rainforest is good for the economy and good development. They also insist that action to tackle climate change is an obstacle to progress. The reality is quite the opposite – to pursue such a destructive path in the medium to long term will have a devastating impact on the living standards of the overwhelming majority of humanity. The alternative – a green transition – provides massive opportunities to stimulate economic growth, create millions of green jobs, improve living standards and avoid the multitude of humanitarian disasters that will happen if climate change is not stopped. A comprehensive study published in Nature in 2018 showed that greater action to curb global warming would bring massive economic benefits. The study says that there is a 75% chance that keeping global warming to a 1.5°C rise instead of 2°C would lead to a $20-trillion increase in world GDP by the end of the century. There is hope. Internationally the left is providing leadership which clearly shows why a green transition is the solution to protecting the environment as well as promoting sustainable economic development. The policies of the Workers’ Party (PT) on reforestation and promoting renewables are a global example. In another example, the insurgent left in the US is also leading the way. The proposal being put forward by US Congresswoman Alexandria Ocasio-Cortez for a ‘New Green Deal’ advocates the US government launches at least a trillion dollars in state investment to eliminate fossil fuels and switch to 100% renewable energy in the next decade. This is exactly what is needed and she is correct to point out that such a course of action would inevitably boost growth and create jobs. China’s massive state investment in renewable energy has demonstrated the transformative benefits that investing in a green transition can bring – proving that it makes economic sense. In 2016 China invested $103 billion in renewables, which was 36% of the world total whilst in 2017 China’s investment in renewables was up to $132.6bn – a quarter of global investment in renewables. The impact of this massive state investment has been to make renewable energy prices competitive with fossil fuels. China is set to further increase its global leadership role on renewables. In its 2017-2022 forecast, the International Energy Agency predicts that China’s share of renewable energy capacity growth will account for 42% of the global total in solar, 35% of the global total in hydro and 40% of the global total in wind. Such large scale state investment in renewable energy, instead of an expansion in fossil fuel extraction, is what is needed on a global scale to stop climate change. 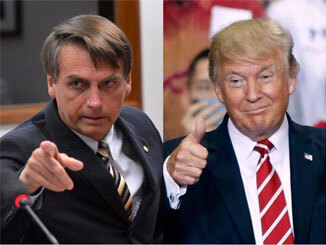 The combination of Trump and Bolsonaro’s policies are toxic for the planet. They are so destructive that they threaten the long term prospects for human development and require immense, joined up, international resistance. The article above was previously published here at Eyes On Latin America.